As 2018 draws to an end and our sights turn toward the new year, we all begin to feel a sense of expectation. What will change? What will we experience? What will we accomplish? I bet you're like me, and you want to be part of something incredible. In fact, I want to be part of something that only God can do. Foster the Bay is on a wildly impossible mission. We’re working to provide a loving home for every child in foster care, and we have the audacity to believe we’ll succeed. We believe we’ll see the day when every child in foster care will find hope in a loving home. We believe we’ll see the day when the Bay Area has been transformed because of the Church’s extraordinary love. We believe it, because we already see it happening. God is moving in the Bay Area. This year, we had the opportunity to expand into two new counties and welcome hundreds of new partners. Next year, we plan to welcome two more Bay Area counties to Foster the Bay. We’ll be working to double our Church Partnerships and equip hundreds of new Foster Families and Support Friends. Our prayer is that at least 100 more children will experience the joy of family in a loving Foster the Bay home. It won’t happen unless we work together. Our staff and volunteers are ready to invest their time and talents in this vision. Our partners are ready to invest their energy and efforts in this vision. Now, we’re looking for an extraordinary group of believers who will invest their financial resources in this vision. 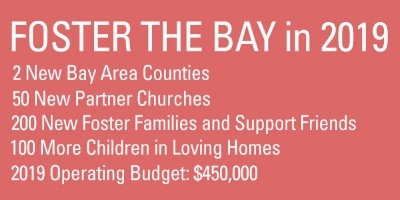 In order to fund Foster the Bay's work in 2019, we'll need to raise a total of $450,000. We are thrilled and thankful that $150,000 has already been committed. The funds we raise between now and the end of the year will offset the remaining $300,000 needed for our 2019 operating expenses and allowing us to move forward without delay. Will you invest in Foster the Bay? Will you join us as we answer God’s call to care for vulnerable children in the Bay Area? Thank you for helping us make 2019 a year when dreams come true!